It is quite possible for fully vaccinated individuals to get measles. It is well understood that some people just don’t respond to the vaccine as intended; their immune systems do not produce a great enough amount of antibodies to be considered protective. This is true of about 5 percent of the population, and it’s the reason a second dose, or “booster” shot, is recommended. That second shot is likely unnecessary for most children who did respond to the first, yet it’s given routinely to everyone anyway, even though the purpose is to target the few non-responders. Even after a second dose, however, 3 percent or so of the population still won’t respond. Moreover, the vaccine-induced immunity, unlike the more robust immunity gained from natural infection, wanes over time. 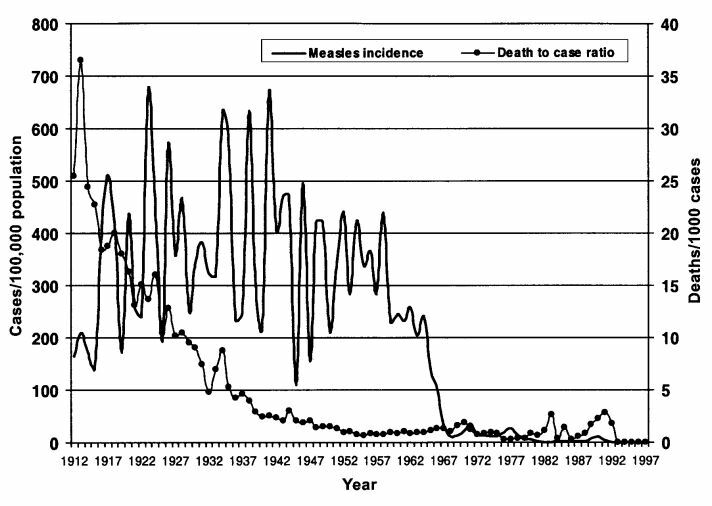 In fact, the CDC considers birth before 1957 to be “evidence of immunity” to measles for the simple reason that pretty much everyone back then was infected with it as a child and gained lifelong immunity as a result. Also, the measles vaccine is a live-virus vaccine, and individuals can potentially get the disease from the vaccine as well as shed the virus. Vaccine-strain attenuated live viruses can replicate and revert back into virulent form (which is why they don’t vaccinate immunocompromised individuals) or recombine with other viruses to create novel virulent strains. This means that individuals who have received a live-virus vaccine can potentially catch the disease, as well as transmit the virus to others. This is why the live oral poliovirus vaccine was withdrawn from the market in the US, for example; every single domestic case of polio since 1979 was caused by the vaccine. In fact, as already noted, it used to be that nearly everyone was exposed to the virus, usually in childhood, and gained lifelong immunity as a result. The virus was still around, but it was becoming less deadly to the US population due to an improving standard of living, better sanitation and hygiene, better nutrition (e.g.,vitamin A is important for reducing measles mortality and decreasing morbidity), advances in health care, and so on. What the declining mortality rate indicates is that the US population was developing natural herd immunity. We were learning to live in symbiosis with the virus, natural exposure to which not only confers permanent immunity to measles itself, but may help prime the immune system of children to protect against other diseases, as well. But then along came the vaccine and destroyed that natural herd immunity. The concept of “herd immunity” today is universally associated with the use of vaccines, but this is an application of the concept in fact borrowed from the observance of natural herd immunity to disease. 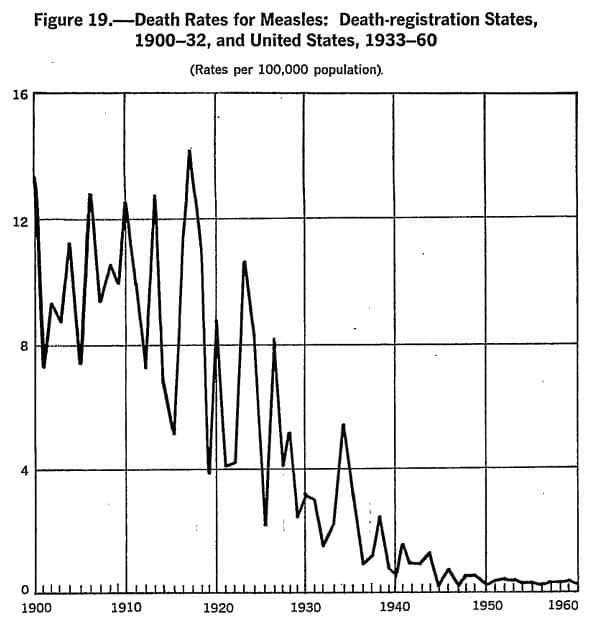 In the case of measles, researchers in the 1930s—long before the vaccine existed—observed that epidemics in Baltimore occurred in predictable cycles and only when the level of immunity in affected communities was less than 55 percent (far below the 95 percent or so level of vaccination hypothesized to provide herd immunity with vaccination). Now since nearly everyone is vaccinated at an early age, they don’t become infected with the disease in childhood and hence don’t develop the more robust permanent immunity conferred by natural infection. While vaccine theory is premised on the idea of inducing humoral immunity, which involves an antibody response, scientists have learned the production of antibodies is neither always sufficient nor even necessary for the development of immunity. Since the vaccine-induced immunity from the measles wanes over time, in the event of an outbreak, individuals are at greater risk of developing the disease in their adulthood, when it poses a higher risk of serious complications. The government and media, of course, blame every outbreak on parents who choose not to vaccinate their children. This was true of the Disney outbreak earlier this year, even though the majority of cases were in adults. Measles outbreaks can and do occur in highlyvaccinated populations. Even if there was a 100 percent vaccination rate, outbreaks could still occur for the reasons already noted: some individuals do not respond to the vaccine, and the immunity of those who do wanes over time. Moreover, because of public vaccine policy, mothers today who were never infected during their childhood and hence never developed robust permanent immunity are less able to protect their newborn babies from the disease in the event of an outbreak. Without the vaccine, women would be infected as children and develop a permanent, robust cell-mediated immunity while continuing to be frequently exposed to the virus, thus also providing a harmless natural boost to their antibody levels. When they become mothers, they would then confer protection to their infants by passing on antibodies through their breastmilk. But now, since women were vaccinated as children, they likely have a waning antibody titer by the time they start having children. Because the vaccine has quite successfully reduced transmission of the disease, they have not received the beneficial natural boosting of antibodies. Hence, they aren’t able to pass on that antibody protection to their infants. Public vaccine policy has thus shifted the risk burden away from those in whom the disease is generally well-tolerated and onto those in whom it poses a higher risk of serious complications: adults and the most vulnerable members of society—infants. Such long-term population-level negative consequences of vaccines simply don’t receive any consideration in the mainstream discussion. Under the law, the National Vaccine Injury Compensation Program was also established to shift the financial burden of compensation for vaccine injuries from Big Pharma to the consumers. The program is funded by a $0.75 tax on every antigen dose of vaccines (so every time an MMR shot is given, being a combination vaccine, $2.25 is taxed for the purpose of contributing to the national vaccine injury fund). The Supreme Court has upheld legal immunity for vaccine manufacturers on the grounds that certain adverse reactions are “unavoidable” and “design defects” are “not a basis for liability.” Justice Antonin Scalia described this special accommodation for Big Pharma as a “societal bargain”. The line from the New York Times and other mainstream media that vaccines are harmless is hard to reconcile with the fact that corporations like Merck have been granted legal immunity by the government on the grounds that vaccines are unavoidably unsafe. As a further illustration of how utterly ignorant and irresponsible such dismissals of the risks associated with vaccines are, one need look no further than the vaccine manufacturers’ product inserts. Merck’s product insert for its measles, mumps, and rubella (MMR) vaccine states that “Unnecessary doses of a vaccine are best avoided….” Surely, there must be a reason? It happens there are many. It is perhaps not too surprising that many of these adverse reactions are the same as the symptoms or complications of wild-type measles itself, including: fever; headache; diarrhea; vomiting; encephalitis; seizures; pneumonia; rash; and, of course, death. Of course, Merck and public health officials maintain that serious adverse events are rare, less than the risk of developing the same complications from the disease. But, then, the recent case in Washington is the first confirmed case of measles-related death since 2003, while there have been 65 deaths since 2003 reported to the nation Vaccine Adverse Event Reporting System (VAERS) following vaccination with MMR. Furthermore, the possible adverse reactions listed in the product insert are just a list of known reactions from short-term studies—(and the vaccine manufacturers conduct their own studies to get FDA licensure)—and postmarketing surveillance. The long-term effects of vaccination and its interference in the natural development of an individual’s immune system haven’t been well studied, such as whether vaccination has contributed to the alarming increases in asthma, allergies, and autoimmune diseases. The continued use of mercury as a preservative in flu vaccines and the use of aluminum as an adjuvant in numerous other childhood vaccines are particularly worrisome practices. Both are known neurotoxins that can pass the placental and blood-brain barriers. There has never been a double-blind, placebo-controlled study of long-term health outcomes between vaccinated and unvaccinated individuals. As much as the media likes to say that science has shown that there is no risk of developing autism from vaccines, there has never been a study comparing autism rates of individuals who’ve received the CDC’s recommended schedule and unvaccinated individuals. Moreover, it is known that vaccinations can modify gene expression, and certain individuals may be genetically predisposed to having adverse reactions or long-term negative health consequence of being vaccinated; yet public policy treats vaccination as a one-size-fits-all solution—thus playing Russian roulette with our children. This is all just scratching the surface. The point is that the media treat the subject of vaccines as though there wasn’t even a discussion to be had—just fall in line and get your damn shots! This is dishonest and anti-intellectual. The popular accusation that anyone who questions public vaccine policy is “anti-science” is a particularly hypocritical creed reflective of the intellectual dishonesty and sheer laziness of mainstream journalists who bow to the altar of the state religion and preach official dogma rather than doing their jobs. Notwithstanding the pretense to the contrary from public health officials and the mainstream media, there is a discussion to be had about public vaccine policy. We ought to start having it. Jeremy R. Hammond is an independent political analyst, award-winning journalist, founder and editor of Foreign Policy Journal, and author of Ron Paul vs. Paul Krugman: Austrian vs. Keynesian economics in the financial crisis and The Rejection of Palestinian Self-Determination: The struggle for Palestine and the roots of the Israeli-Arab conflict. His forthcoming book is on the contemporary U.S. role in the Israeli-Palestinian conflict. Follow him on Twitter @jeremyrhammond.